I'm sorry. I don't like s'mores. I love each component separately (especially ooey, charred, wood-flavored marshmallows), but together they create a sloppy, difficult-to-enjoy dessert. 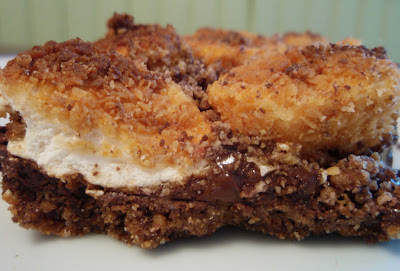 S'more bars, on the other hand, make my complaints irrelevant--the mess factor is completely gone. The brittle graham cracker that always breaks and usually fails to keep a s'more together is reduced to crumbs. The slab of chocolate is nicely ensconced in those crumbs. The marshmallow, although not charred or wood-flavored, is contained but still gooey and delicious. Wonderful. The graham cracker crumbs that I ultimately used came from a sample of chocolate graham cookies that I got from work (hooray for perks!). I used toasted coconut marshmallows because a)that's all I had, b)I love coconut, and c)obviously, the "toasted" part would lend itself to a more authentic s'more experience. Finally, and most importantly, the chocolate I used (in combination with some semi-sweet chocolate chips) was the last of my Amano stash. 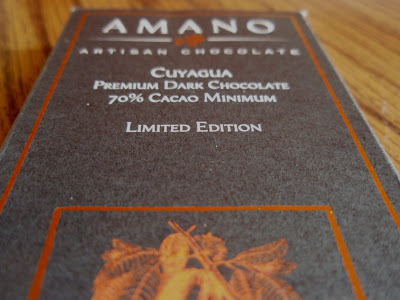 It was their Cuyagua bar, said to have notes of spice and melon. Oops--maybe not the most appropriate for this dessert, but nevertheless decadent and intoxicating. In order to correctly enjoy these bars, they really should be eaten immediately, while the marshmallows and the chocolate are still slightly melted. I guess the microwave could be used in a pinch, since eating an entire batch at once probably wouldn't end well for anyone (unless there was a money prize involved). Put 1 1/4 cups graham cracker crumbs, sugar, and 6 tablespoons melted butter in a 11 x 9-inch baking dish. Using a fork or your fingers, mix well and then press into the dish. Bake at 350°F for 7 minutes or until it begins to brown on the edges. Distribute the chocolate evenly across the surface of the crust. Put the dish back into the oven for 5 minutes or until the chocolate has melted enough to be evenly spread across the crust. Once the chocolate is spread, add enough marshmallows to cover the chocolate. Put the dish back in the oven and allow it to cook for 5 minutes or until the marshmallows puff up and turn golden brown on the edges. Remove the dish from the oven and spread the marshmallows so they evenly cover the surface. Combine 2 tablespoons butter and 1/4 cup graham cracker crumbs in a bowl and sprinkle mixture across the surface. Bake for 10 minutes or until golden brown, bubbly, gooey, and irresistible. OMFG Grace. Will you adopt me? I promise I'll do the dishes. YUM! I agree with you about s'more cookies. i love the parts, but the eating of it....all breaking and goozing...not so much. This looks amazing!! And you could just make a couple of small ramekins, or however much you wanted. Needed. Wanted. When I saw the first photo in my aggregator, I couldn't quite tell what it was, but I could tell I wanted it. Real bad. I wonder what that says about me. :) Luscious as always, Grace! You had me with melting cococnut marshmallows over chocolate Grace!! This looks awesome! I love roasting marshmallows, and of course, I love chocolate. But I've never really been a huge fan of the campfire S'more. These bars, however, I would really like to try. Another plus is that you don't have to break out the lighter and firewood! Like someone suggested, perhaps you could make these in ramekins and bake them as needed. Or perhaps use a blowtorch to remelt the marshmallow. Or I could just be dedicated and eat the whole thing while it's at its best! I agree that smores are awfully messy but they're so good I still put up the mess. Looks delicious, Grace. My pal Joanne (from The Box House blog) always says the blog world has a hive mind, and it's true; I have a s'mores post coming up soon. I do mine as a tart, which also helps do away with the mess. But these sorely tempt me to make bars. Yum! Grace, you don't like s'mores?!! Well, I suppose I can forgive you this once because the bars you make are equally, if not more tempting. 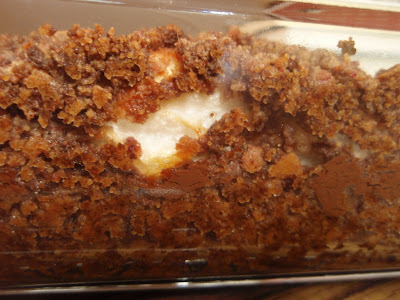 These smores bars look totally yummy! I think I'm going to bookmark them! My sister is the biggest s'more fan I know... I'll send her your recipe because she will love it. Nice photo! Woooooo, mercy! Oooey, gooooey goodnes gracious those look great. this looks awesome. i'm going to have to bookmark the recipe to make with my sister next time we're together...minus the coconut part, since she's not a huge fan. Oh geez this look fantastic! Wow, another winning recipe...Gawd that drippy chocolate...ridiculous. Ooooh Grace you had me at "gimme s'more" OMG!! they look absolutely yummEEEE! I love it, I love it ALL. Smores the regular way, ingredients on their own, and THESE BARS. I'll take it all off your hands. I think I'm in love. Add a dash of peanut butter and I'd marry it. but I'd be more than willing to try those...repeatedly. oh ah uh oh ah.... sorry at the moment that was all i could get out.... these look fantabulous. Must try. Must eat. Must try and share. Thanks Grace for this recipe!!! After the stressful day at work that I had, I cannot begin to tell you how much I wish I had some of this right now!!! I like regular s'mores, but I bet I'd love this version even more!! This is on the Atkins diet, right? Ha Ha. Ugh, this looks decadent. The bars - oh yeah - a total home run. I've always been kind of on the quiet side about my distain for smores because I really hated the sticky messy eating of them. The kids all love em so what the heck do I know??? That first photo is so drool-worthy. What a fantastic dessert, and so simple too! I love this. Those photos ... especially the one with the melted chocolate ... Wow! My husband would be in absolute s'more heaven. The man loves chocolate. And marshmallows. And graham crackers. Eating them immediately would not be a problem for him. When should I send him over? Wow Grace, I adore coconut and you! I learned to make s'mores when I was a girl scout. Thanks for a recipe to make these without starting a campfire. Yum Yum. I love smores you are making me wish I went camping this year! That looks awesome! I do like s'mores a lot, but I think this is way better! Genius in fact. droooool....I love s'mores, especially with burnt marshmallows. but they're messy. These, I could gladly enjoy! You had me... right down to the coconut part! Although it is almost un-southern of me, I just can't deal with shredded coconut. Of course that is easy enough to fix. Beyond that detail, these bars look amazing! 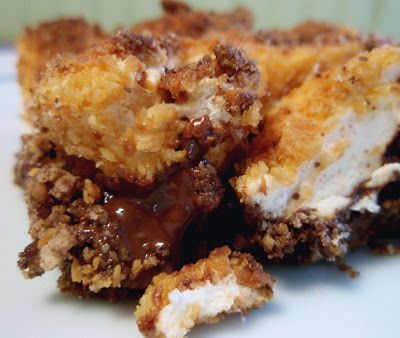 Drool drool drool - smore bars!! Oh wow. And what's with this Amano chocolate?? I just finished reading another post about it. I've got to find it. Grace- these look incredible. I read this yesterday, and then found myself thinking about them today on my train ride home (of all places) meaning that these must be tried! Oh my this looks like all sorts of yum. This is just amazing! Can I have seconds? Love the addition of coconut! The bars look great! I agree too about the smores. UnGodly sweet. I love each component but together they are just too sweet. Wow! 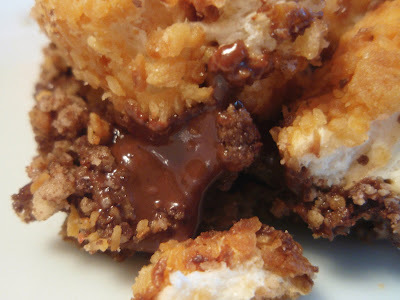 I didn't think s'mores could get any better...how dreamy! :) Mighty delicious chocolate you used there, too! Thanks for the recipe. Your opening line cracked me up. How could anyone not like smores? whooo, that picture of the melting chocolate is amazing! Now I cheated and read the other post about the happy accident first, but hot out of the oven this looks fabuloso grace! It has been a long time since I last had a smor and these coconut smores sound good.